Elaine Gan, Bettina Stoetzer, and Anna Tsing led “Feral Technologies: Making and Unmaking Multispecies DUMP!”, a two-day seminar at the HKW’s 2016 Anthropocene Curriculum: The Technosphere Issue. Tsing and Gan work together at Aarhus University’s Research on The Anthropocene (AURA)’s in Denmark, exploring the potential of ferality and unintended landscape design. Of parallel interest, and in preparation for her forthcoming book, Ruderal City. Ecologies of Migration and Urban Life in Berlin (forthcoming) Bettina Stoetzer has been researching ruderal ecologies, examining urban life forms that emerge in inhospitable spaces. In the following conversation Gan and Stoetzer discuss the underlying principles of their seminar, including ferality, ruderality, and how those terms expand our concept of technology. Caroline Picard: What are some key concepts from your seminar? Bettina Stoetzer: “Ruderal” is a botanical term that comes from rudus, which is the Latin word for rubble. It refers to organisms that spontaneously grow in “disturbed environments” usually considered to be hostile to life—the sides of train tracks, for instance, or roads, waste disposal areas, or literally rubble. I draw on this term and develop it as a conceptual device for thinking about landscapes in the anthropocene in my forthcoming book, Ruderal City. Ecologies of Migration and Urban Life in Berlin. The interesting thing about ruderals is that they aren’t really wild or domesticated; they are non-native species and they dwell in the gaps of urban infrastructures like invisible hitch hikers. If we follow their history, a “ruderal city” emerges within which nature is not “out there”—as a site to be managed or incorporated into anthropogenic urban landscapes via technology and infrastructure—but is rather an integral and unwieldy part of the city. CP: I understand that you all went to a park? BS: Yes. Rather than be distanced observers in the classroom, we wanted to ground our discussion in a particular site, to let our encounters with its materiality – its plants, the crumbling infrastructure, alongside its smells and sounds – guide our discussion. The so-called Schoeneberger Suedgelaende seemed like the perfect spot. 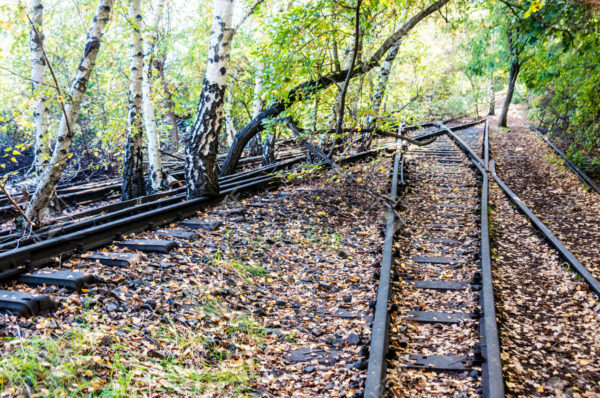 It was an abandoned switch yard for trains during Berlin’s division after the war, and then became a nature park in 1999. The site is full of ruderal ecologies and feral fauna and flora. We invited seminar participants to explore the entangled histories, encounters and ecologies that shape the train yard’s landscape. Encouraging them to experiment with their own documentary practices, we asked what kind of story can we generate in a place like this? EG: We’d been thinking through a short story that Ursula Le Guin wrote. It’s a carrier bag theory of fiction. The part that I really like is, how do we tell new kinds of stories? In our seminar, we use a sense of play amongst different people coming together for a brief period of time—what is a story they can tell from going on a walk? We went to the park in the middle of a thunderstorm, so we could have created what Ursula Le Guin calls ‘scullery stories.’ Life stories that are really open ended. Stories about fungi that might hitch a ride on a leaf, that’s fallen from a tree, that might be decomposing, but nonetheless that fungi is starting a whole new world. CP: Doesn’t Shock and Awe (2004)—the book you co-edited, Bettina—look at how words build worlds? BS: Yes. Shock and Awe is a collection of essays and vignettes that provided something like a dictionary of the world in the post 9-11 Bush era. We were interested in exploring the political life of words. For example, the word democracy, or freedom, or terrorist: the different entries in the book explored how politics and language are deeply intertwined, how words change their meanings and have the ability to alter our experience of everyday life in a world that is marked by imperialism and global war, hence the subtitle “war on words.” It also illustrates how words can be hijacked and reclaimed to enliven a different sense of the political. In other words, the question at stake there was also: what are the feral lives of words and how can we tell alternative kinds of stories about the political? CP: I almost want to tie that into the idea of unintended design in landscapes, at AURA. EG: Sure. AURA is housed within the Department of Anthropology in Denmark and grows out of a five-year Niels Bohr professorship awarded to Anna Tsing. It looks at unintended design in landscapes, or the idea that landscapes materialize because of a whole range of historical trajectories. They don’t come out of human mastery or planning—that’s human exceptionalism, actually. BS: That is again, where the idea of ruderal ecologies comes in. What’s interesting about Berlin’s post-war ruderal plants and their larger ecologies is that they are the outcome of nationalism, war, environmental destruction, and trade. So there are all kinds of layers of the city’s histories, its economic, political and economic conditions that have materialized in the actual ecology and flora of the city. On top of that we have making, unmaking, and above all, we have growing here. And growth, in the ecological sense, is always dependent on other factors and unanticipated variables—it’s not a uni-directional, one-man, fully controlled, enterprise. Often there is unwanted growth and mutation. CP: How does all this tie back into technology? BS: By stressing the feral and ruderal, we ask: What happens if we don’t imagine technology only in terms of human forms of externalization, but also of internalization and unexpected proliferation and growth? That’s why Le Guin and feminist re-imaginings of technology matter: we want to get away from thinking of technology as the story of human omnipotence. Rather technology, the science of craft, is an open ended process and it’s always embedded in a particular locale and multispecies worlds. EG: Human intention is in a way an illusion, so our approach is coming out of an anarchist politics. It’s an anarchist project to say, what if we decenter the role of humans in landscapes? That’s not to say humans are not part of the picture, but what if they’re one among many? What if we expand the notion of culture and nature and say that there are more than human socialities? What are those socialities? How do we combine multiple disciplines to find out, what are these new kinds of landscapes that are out there that don’t arise from human mastery or human technologies, but rather emerge from the messes that humans have made and particular humans have made? CP: Didn’t you recently curate a related exhibition, Elaine? EG: I’m actually the art director for AURA, which means I get to play with lots of interesting experiments and while I was in Denmark I proposed an art and science exhibition called DUMP! Multispecies Making and Unmaking at Kunsthal Aarhus. I co-curated the show Sarah Lookofsky and Steven Lam. DUMP! has a dialectical structure to it. One the one hand, we wanted to think about industrial ruin or the ruins of capitalism and specifically neo-liberalism. Second, we wanted to think about multispecies life that emerges, and how that might trouble this notion of a hero. A human hero that attempts to make the world. We brought together about 19 different artists, scientists, organisms, including self-healing concrete embedded with bacteria from researchers of Delft University. We also included Mycorrhizal fungi, which is based on the collaborative research between Anna Tsing anthropologist and Henning Knudsen. Basically the show was trying to explore the positive aspects of decomposition; without decomposing, we’d have a world stacked with rubbish, but because of other species, wood breaks down. We also featured Amy Balkin’s ongoing project, Archive Of Sinking And Melting, where she asks anyone who happens to be in a landscape that will disappear through climate change, to send in an artifact from that place, creating an archive of future disappearances. They’re a candy wrapper from Nepal. A discarded patch. Discarded ice shoes for example from somewhere. It’s a feminist exhibition in the sense that we wanted people to look at lives that make and unmake the world. BS: I see a lot of overlaps here. In my book, I am in a way, giving a “ruderal tour” of Berlin. This tour doesn’t follow the neat lines of neighborhoods, communities, urban infrastructures, or institutions, but looks at what emerges in the cracks alongside or between them. What interests me is the unexpected neighbors, the things that may at first glance not have anything in common: what happens if we juxtapose different inhabitants of the city? What interests me is the unexpected neighbors, the things that may at first glance not have anything in common: what happens if we juxtapose different inhabitants of the city? For example, and this comes out of my fieldwork, how do Turkish barbecuers, rubble plants, German environmentalists, East German bunker enthusiasts, sunflower seeds, and East African refugees inhabit the city and connect or disconnect with one another in different ways? What are the material traces of various kinds of social interactions in the city, among both humans and nonhumans? I am excited about exploration and gathering—like Le Guin’s story: you don’t do the god trick of observation, but instead gather, and allow yourself to get a little lost while collecting things you find on the way. If we look closely, cities—and this is also true for the technosphere— are much more interesting and odd than we might think. CP: What it’s like work in such multidisciplinary modes. Like what’s the difference between an artist and curator, for instance? EG: Yes, this is the interdisciplinary question. It’s always very hard to answer. BS: I think, it’s important to not get tied down to the dividing lines between art, curation, creative writing, and scholarly analysis. We re-assemble things as critics, we connect the dots and create new lines of inquiry, new modes of seeing and inhabiting the world. But I also believe it’s essential to redefine existing standards of what constitutes “scholarly analysis” and rigor today. In the case of the ruderals that I mentioned earlier, and I think this is also true for all things feral, the interesting thing is that you often don’t find them with the usual rules of (scholarly) structured observation—but rather, since they emerge by chance, you don’t know exactly where to find them. The kinds of worlds we inhabit today—crowded with unexpected toxins and invisible forms of violence—therefore require us to sharpen our peripheral vision or to practice what the artist Lois Weinberger has called “precise modes of inattention”: you see feral beings as you pass through a place, on the way to somewhere else,. We need to take these kinds of risks (of not knowing in advance where to look) and to engage with multiple things at once in order to understand the complexities of what is going on in the anthropocene. EG: It parallels my work with rice, maybe. At the moment I’m researching six different types of rice, not to put rice at the center of each study, but to actually say, “What happens if we follow the world by looking for a specific type of rice?” The six different studies use rice as an entry point and then examine different companion species gathered around rice. What are these assemblages that come together because this kind of rice has to be cultivated and has to live in the world in a certain way? It’s assuming that the local is always an already global. It’s always an already historical, as well as emergent narrative. By looking at rice, you start to trouble or at least take a more expansive view on spaces and times. CP: That makes me think about something you said earlier, Elaine, how you can look at technology as a kind of responsive prosthetic—like, human identifies a problem, say, the limit’s of an average person’s encyclopedic knowledge, and say the internet or Wikipedia emerges to expand that limit. I guess I wonder if, in the same way, one could look at social and political policy as a kind of technology too? BS: Yes, absolutely, that’s a great thought. That’s also what I gestured at earlier when I said it’s interesting to look at what emerges alongside institutions, infrastructures, and formal economies. It’s the same with policy making: there is always an excess and unexpected outcomes that are not anticipated and cannot be fully governed. In the context of migration, we see this happening now in Europe and across the world: the scrambling to control national borders against so called “floods” of refugees and migrants (note that refugees in the much debated refugee crisis in Germany right now are likened to waves and tsunamis, and thus to natural disasters). And yet there is an excess of people’s resilience, their desire to survive and make things livable. That is also the Anthropocene. CP: Do you all think the Anthropocene is a fad? Of course I believe in the seriousness of our ecological times, but I also notice a high amount of fervor around the word. What is the world-building around that word? BS: I think the Anthropocene is a tricky term. It’s both good to think with but it also has its limits. It gets humans to reflect on their own accountability and pushes one to reflect on how we have gotten ourselves in this mess. We live in a world in which humans have so profoundly altered the geological and material development of the planet that its entire survival is at stake. But I also think there is a risk in the current proliferation of the term: First of all, the word “we” characterizes a lot of talk about the Anthropocene. Who is this we? Certainly not everyone is affected in the same way. So it’s important to come up with alternative stories that don’t gloss over power imbalances. Then there is also what Donna Haraway has pointed out: the Anthropocene easily turns into a very Christian narrative of “Man” contemplating his own death. It’s capitalism that got us into this mess after all. EG: I think we’re still in the Holocene. Although there are many landscapes that are definitely in the Anthropocene, the Anthropocene is a proposed term. I want to say it’s a conceptual device that allows us to say that human disturbances have reached such a massive scale that we’re changing planetary conditions in very uneven ways, that there are what Rob Nixon calls, slow violences, and we need a way to tag them. We need a way to mobilize around these huge destructive machines of neoliberalism. I think it’s useful to call that the Anthropocene. People like Donna Haraway for example wants to think about the Capitalocene, Anna Tsing wants to say Plantationocene. There’s also the Chthulucene. In all those terms I think there’s an attempt to name how we got here. There’s an attempt to say, what is a dominant figure that might tell us more about our contemporary condition? Is that plantations? Is that capitalism? Is it the figure of Anthropos, which is the Greek word for human, but it’s in a way making that figure visible, whatever it is so that we can unmake it, so that we can undo certain agencies that it’s managed to unleash into the world. In saying that it’s Anthropos, in saying that it’s the human that has caused planetary disturbance and it’s basically knocked the earth off its axis, so that sunlight has changed, photoperiods have changed, wind directions have changed. We’ve changed the temperature of the earth. That’s crazy. If it’s a figure of a human that allows us to say, “How do we undo that?” Then become more human, then I think it’s useful. I hope it’s not a fad because we’ve heard these warnings since the 70s. BS: Yes, I agree with Elaine: the potential of the term is that it creates the possibility to get out of former anthropocentric thinking and modes of being in the world. But we need to combine a discussion of the Anthropocene with a sensibility for the limits of human omnipotence and its colonial trajectories. And that’s why ferality and ruderal ecologies are important. EG: We’ve heard the warnings since 1920, so we can probably say we’ve been hearing about this for very long periods of time. We haven’ heard them enough, and so we’re in the situation. I think it’s a useful term in that sense. My worry about is if we use it so much, we might stop hearing what is useful about it; we might get desensitized, though I hope we don’t. I’d also add that the world has ended for many groups, depending on what point of view you have. The image of Earth Rise—from the Apollo missions—give us a sense of the blue earth. We’re able to say we’re in the Anthropocene because of that image, but for some groups, a river was the world, a forest was the world. For certain species, a leaf might be the world, and so we’ve ended those worlds many times before. BS: It’s unsettling to see how easily earlier feminist and postcolonial critiques of identity politics and the nature culture divide seem to be forgotten in discussions of the Anthropocene. I think the key challenge is to reconnect these critical interventions with the concerns raised by the Anthropocene. The question is not simply a matter of standpoint of who is speaking. But who or what do we connect with and who gets represented and what bodies come to matter as we engage the Anthropocene? This interview was conducted on behalf of Bad at Sports and the HKW.